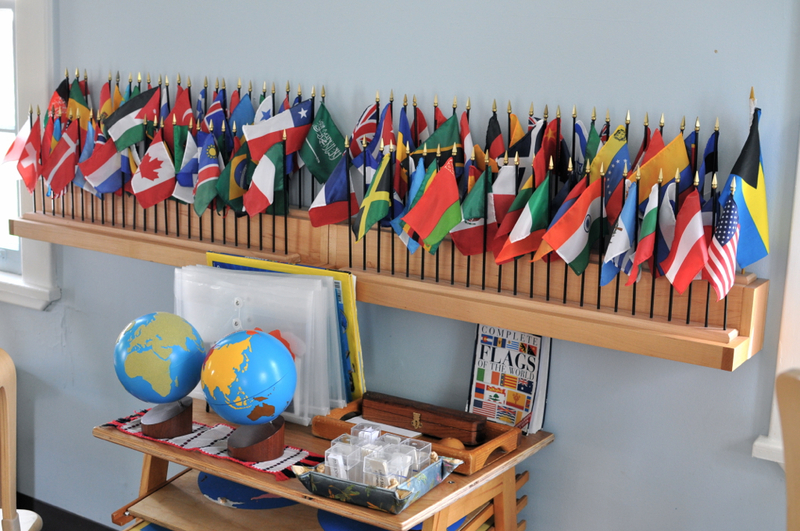 Recently, I was lucky enough to sneak in to take some photos of two of the primary Montessori classrooms after school (alright, I didn’t technically sneak in, I asked the directresses who were so gracious to say yes). And just to be clear, this was immediately after school was let out; the order and organization of each room is evident in the pictures. There was no need to straighten up or prepare for pictures. 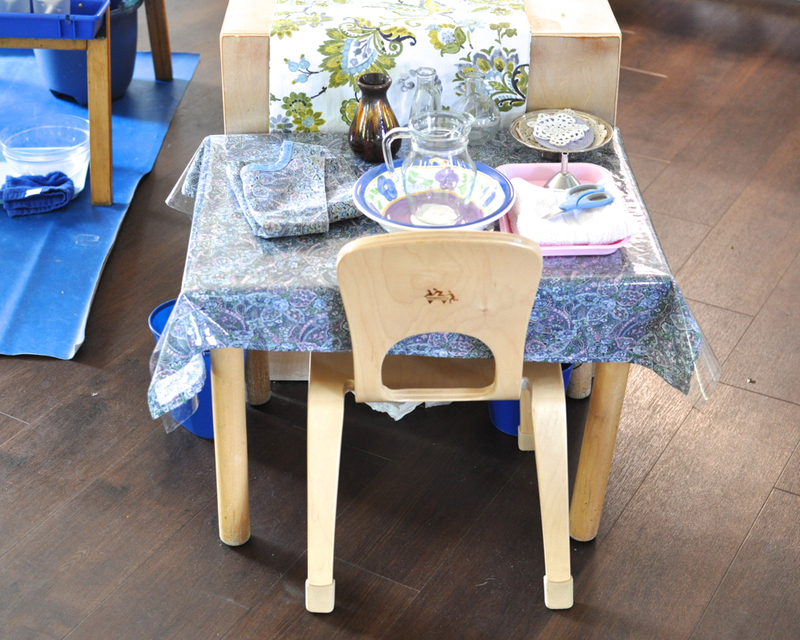 The classrooms are kept this way by the children, who are taught to return each item after they are finished using it. Another part of their routine includes jobs such as washing tables, drying tables, putting up chairs, emptying water buckets, etc. at the end of each day. Emil was with me, giving me the tour. I wanted him to feel empowered by the experience, so I followed him around; after all, this is his space and he is the expert! 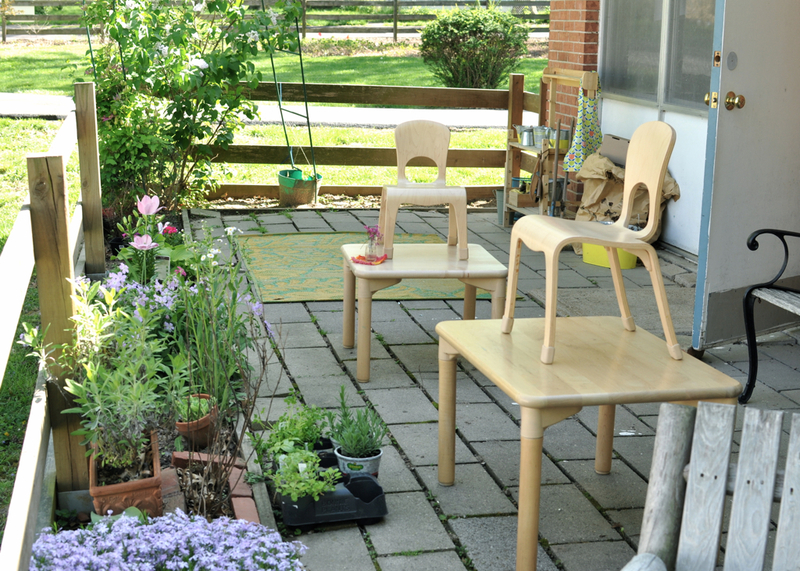 We started with the outdoor space outside the elementary classroom, where there is a lovely bench swing. 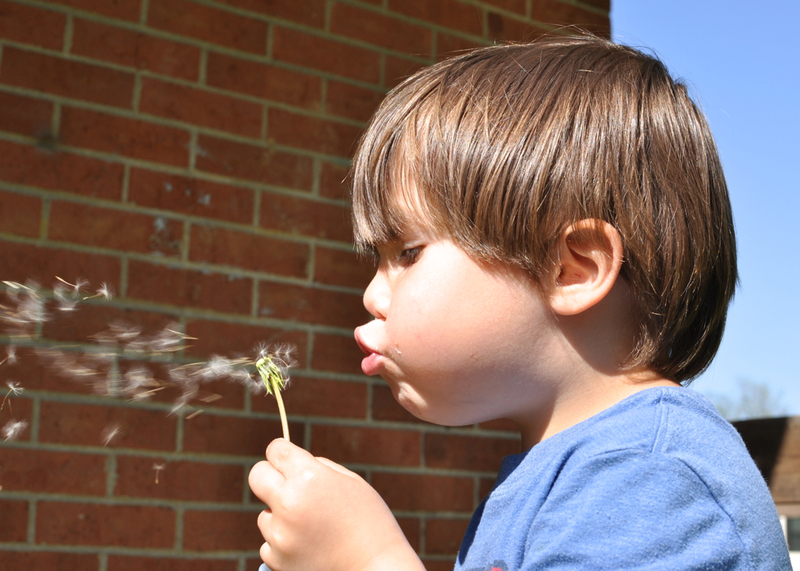 … and the dandelion seeds to blow. 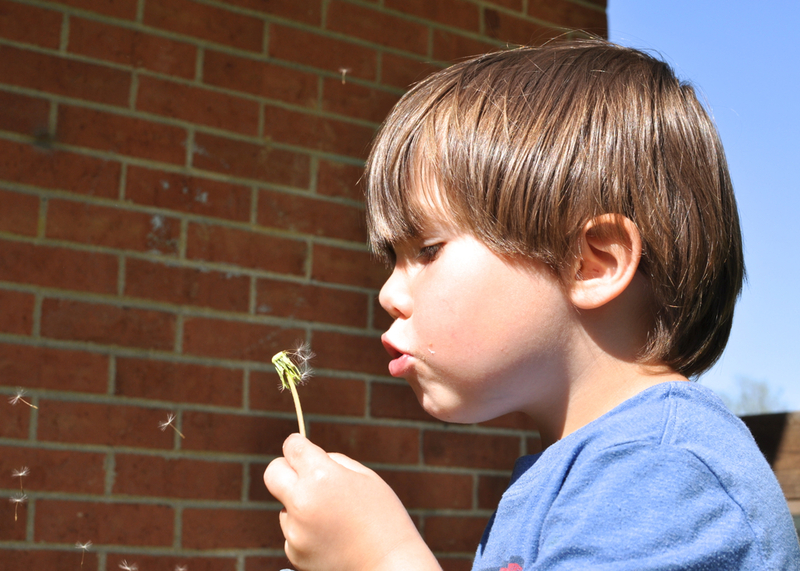 Milo recently taught him to make wishes. 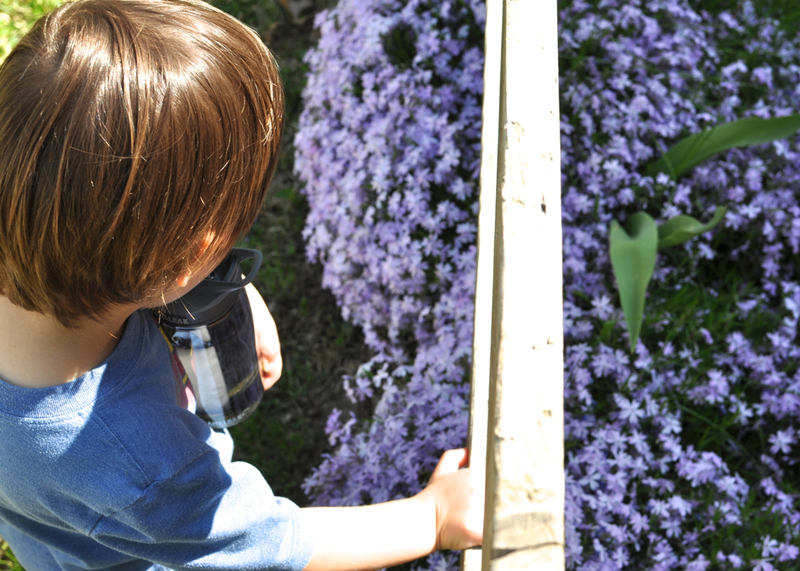 As the weather has warmed up, the children spend a lot of time working outdoors. 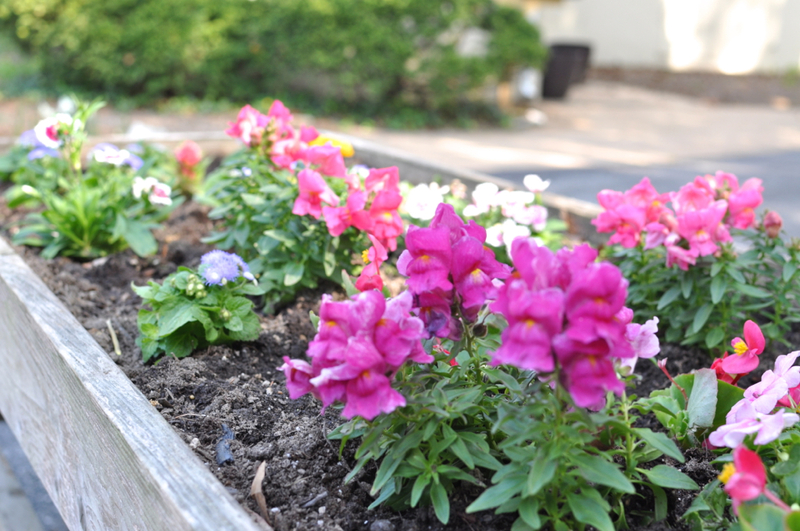 They can bring certain lessons out to one of the tables and work in the fresh air. Emil and Oliver have also expressed that they enjoy the bird-watching out there. One of the classrooms, flooded with afternoon light. 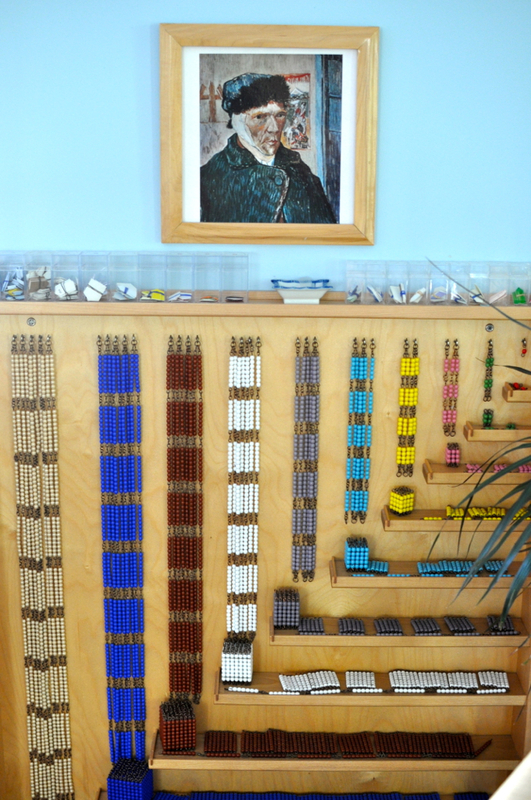 Above is the bead chain cabinet, which includes color coded chains, squares, and cubes for math lessons and games. 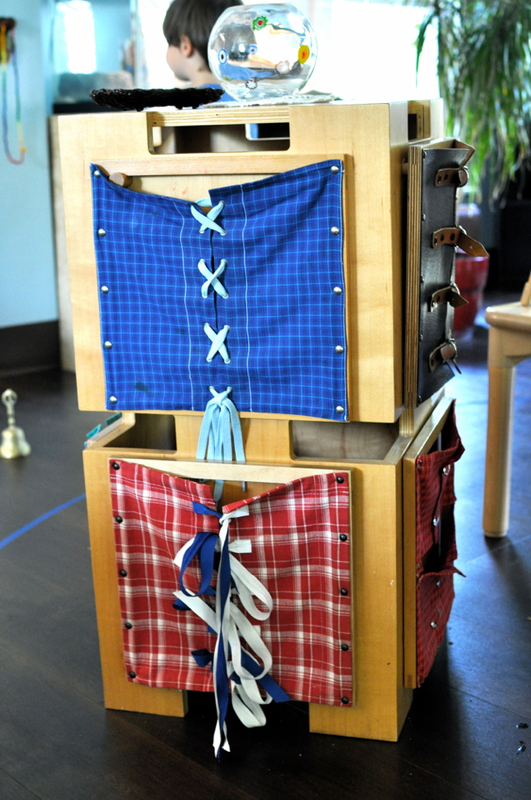 An upright tying frame, which also has buttons, snaps, buckles, and straps on the other sides for practical life lessons. 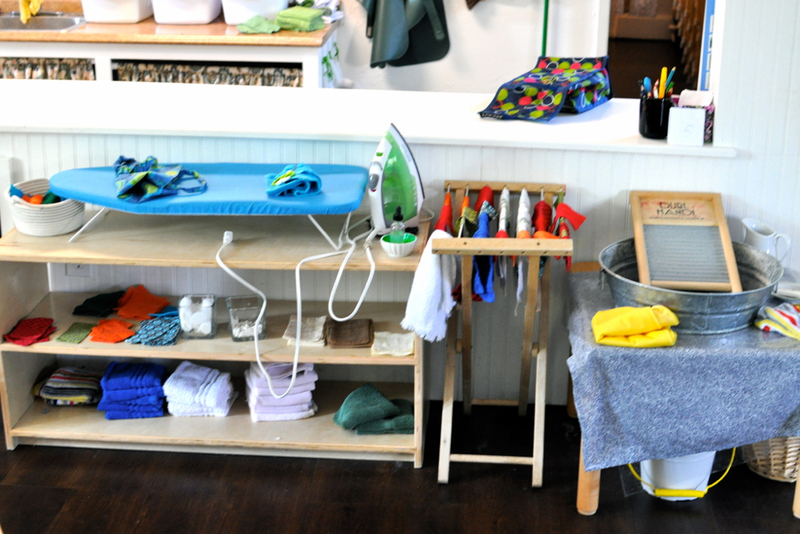 Ironing and washing stations, above. 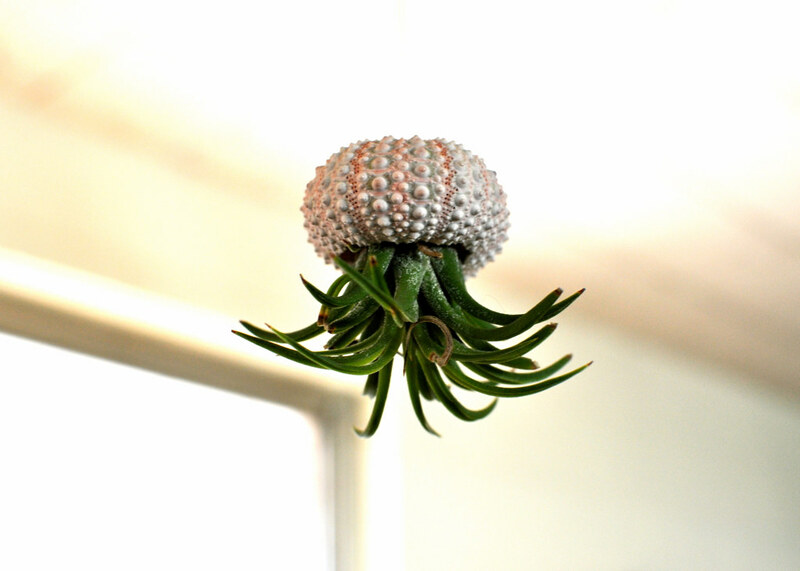 Flower arranging, below. 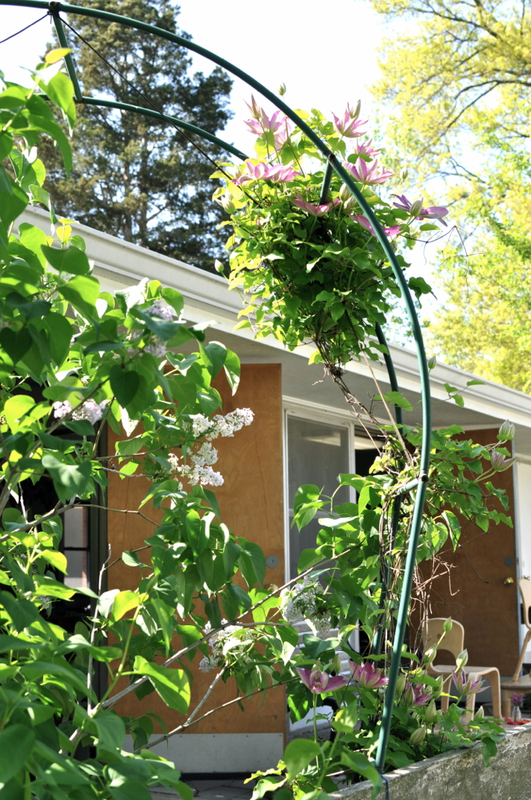 Outside one of the classroom’s front door is an area where the children have planted flowers brought in by the parents for Earth Day. 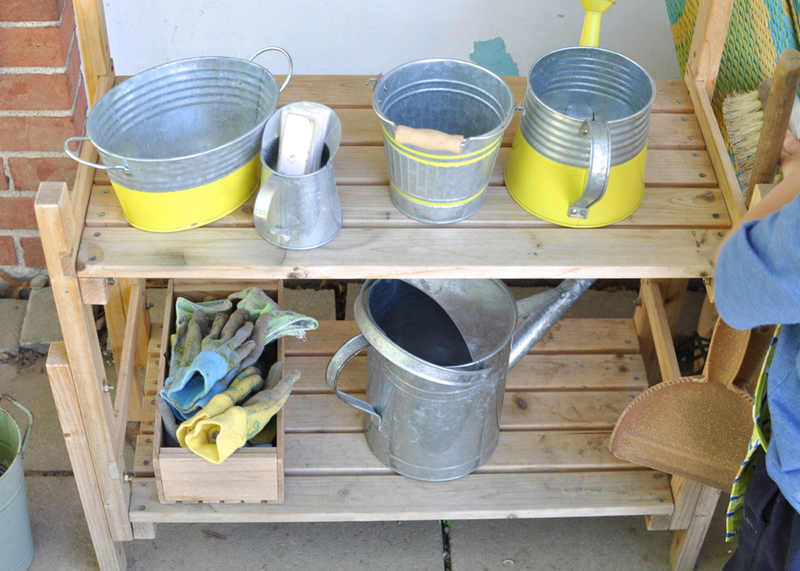 The children love to water and care for their little plants, outdoors and in! 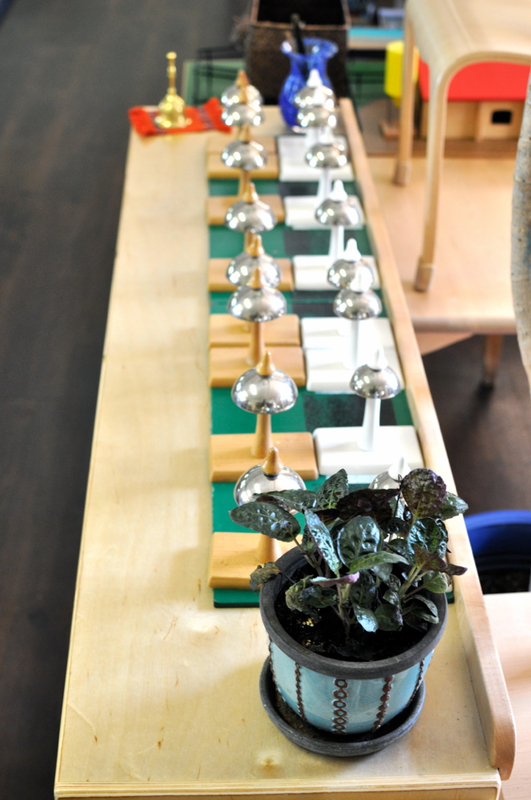 Above, the cylinder blocks, used for sensorial lessons. Children work on their pencil grips and also learn about sizing, dimension, and matching with these materials. I find these so visually appealing, but obviously it’s about so much more than that. Children learn about differences in diameter during the lesson. Check out a good video to introduce you to a cylinder block lesson here. 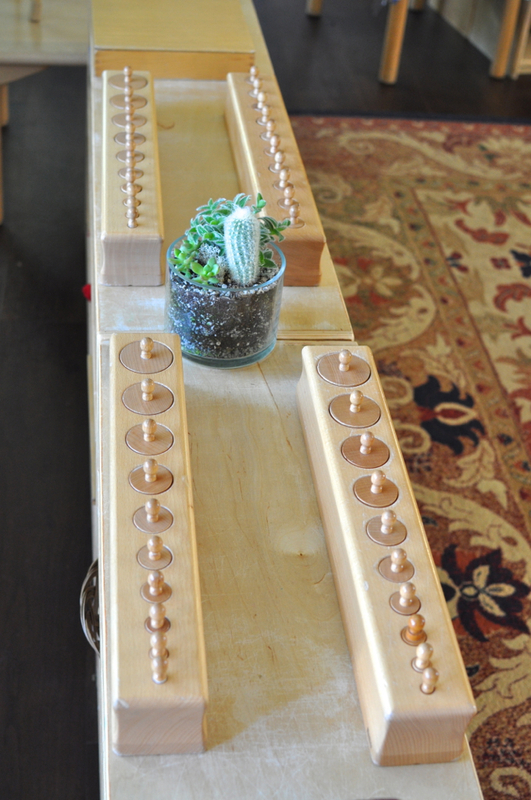 Above, metal insets, which are a part of the language lessons in Montessori. As children trace around the metal insets, they will replicate the movement their hands will make for writing every letter of the alphabet. Handwriting prep! This is one of Emil’s favorite activities. 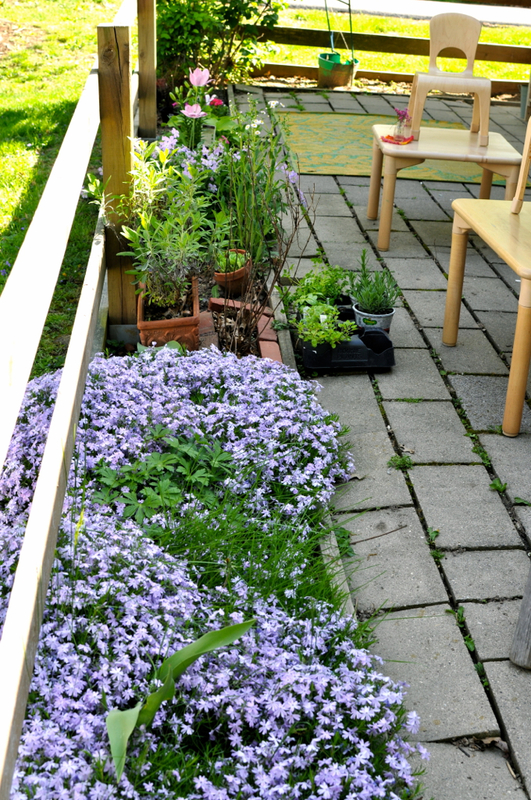 Next, Emil showed me his outdoor area, including the garden and watering area. I was completely quiet as he showed me around. 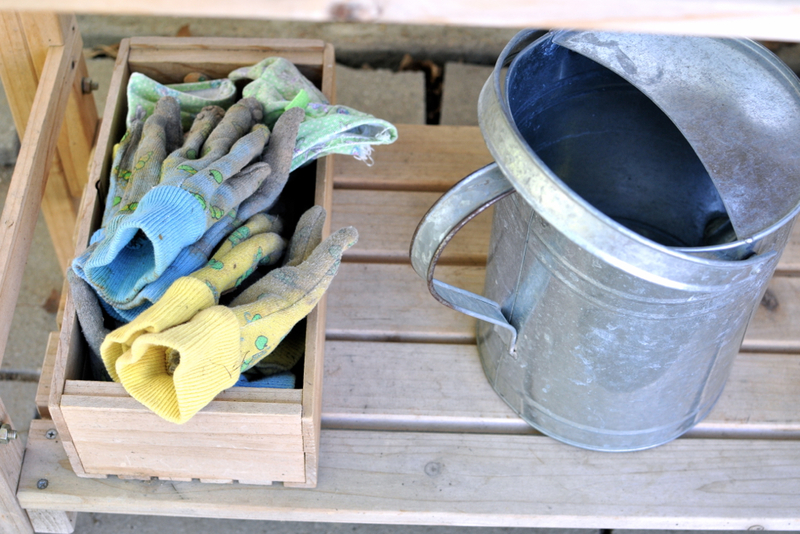 He went over and first put on an apron, then a pair of well-loved gardening gloves (which he then took off when he decided to sweep up). 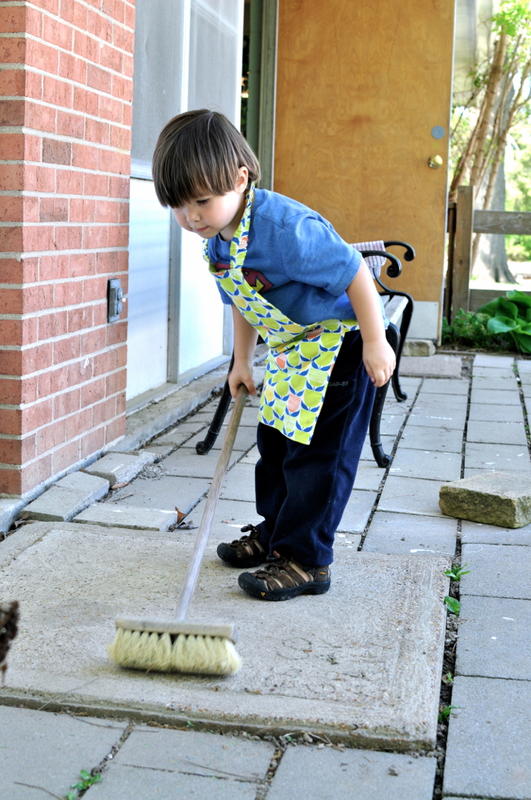 He showed me how to sweep up this area. He was very serious. 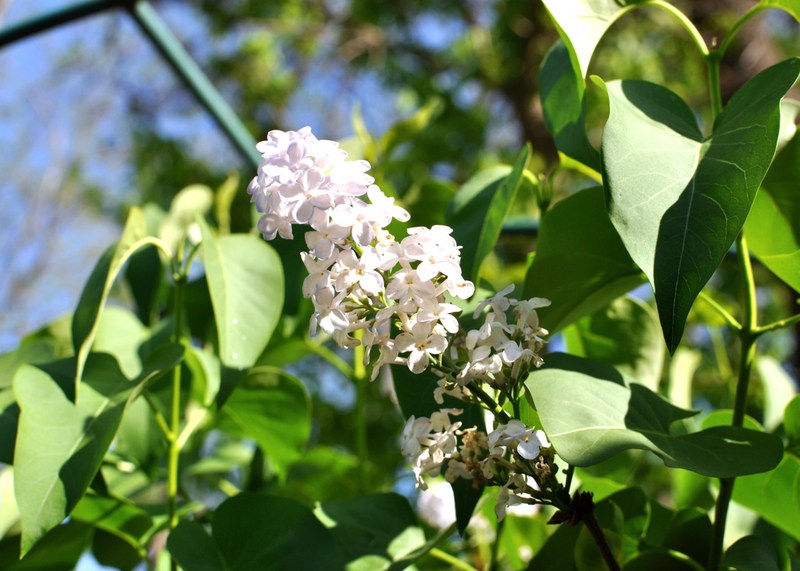 All the blooms were so cheerful! Back inside, Emil showed me the bells. The lessons on these include identifying the notes and tones, going up and down scales, matching, and discrimination of sounds. There is a specific order with which to do everything — all very purposeful. Above, the work mats upon which the child sets up his or her lesson. The purpose of the work mat is to define the child’s work space and to reinforce the Montessori principle of “freedom within limits.” The defined workspace promotes an element of respect; each child respect’s the other’s space and know not to disturb another child’s work mat. They walk around their peers’ work mats, not on top of them. Before a lesson, a child will choose a work mat and carry it somewhere in the classroom where there is space before unrolling it on the floor and then carrying their lesson over. 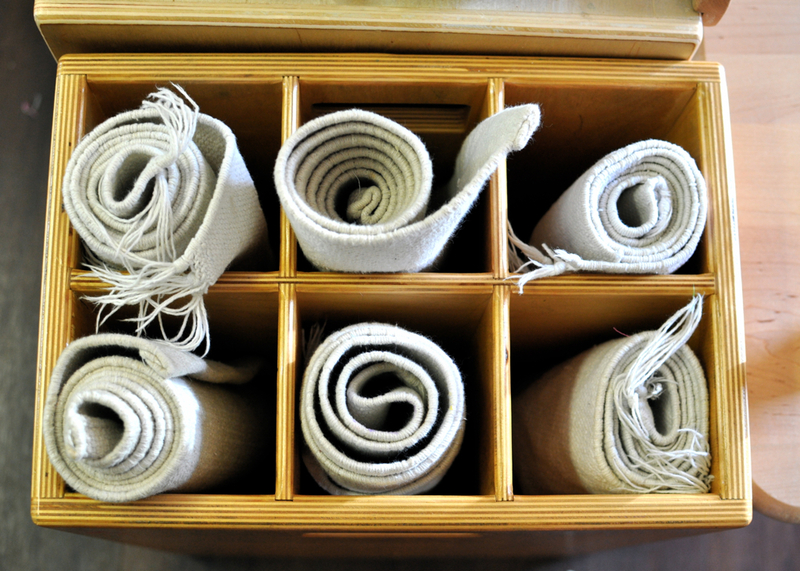 The unrolling and rolling back up of the mat is also a skill in itself! The atmosphere of this classroom is so calm and peaceful. 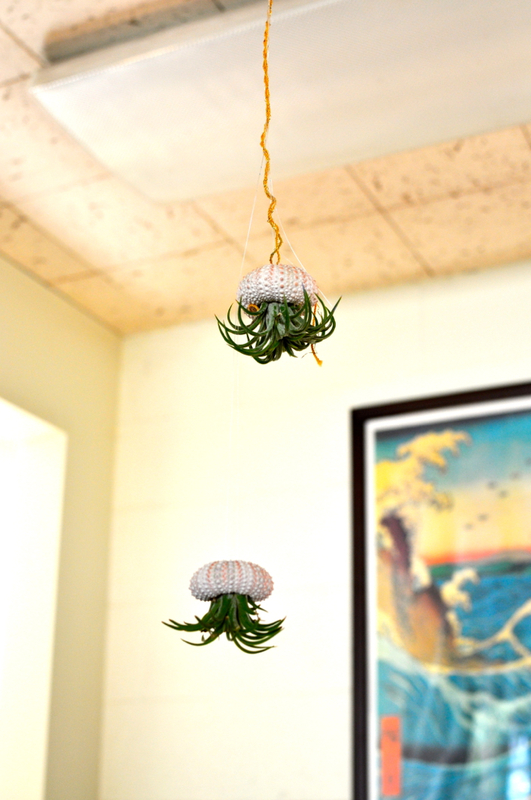 There are plants and animals everywhere! 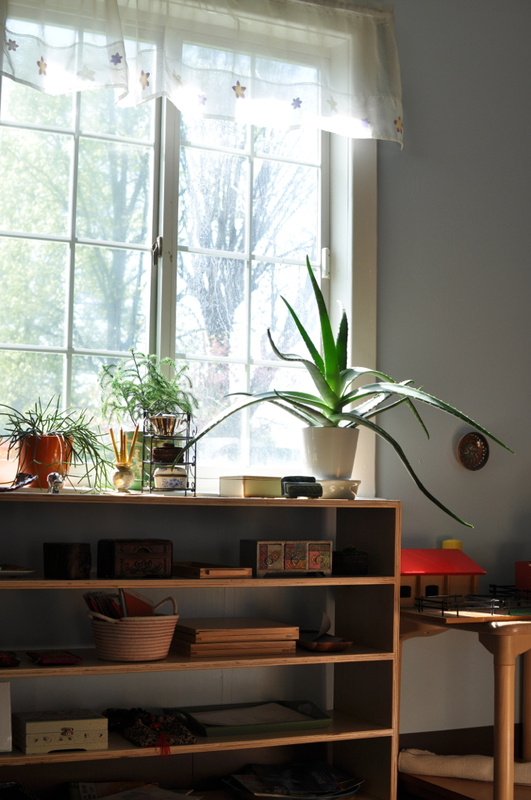 The classroom itself is made up of soft colors, natural lighting, and uncluttered spaces, all of which contribute to a calm and focused learning environment. You may have noticed the purposeful absence of desks and chairs. Here, children work at tables together or alone, but mostly they spread out on the large soft rug, some working lying down on their belies, others on hands and knees, some sitting cross-legged. 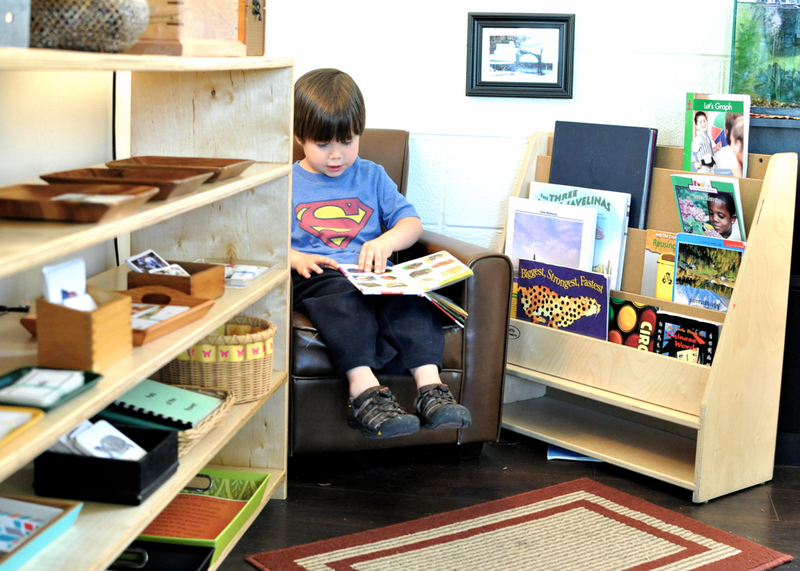 When I observed awhile back, I was amazed by the “buzz” of the room, a quiet but busy movement of children using their bodies in natural, comfortable ways instead of being expected to sit for hours on end in a chair. If they choose to sit in a chair, however, they can! Emil showed me his reading area and even “read” me a book. 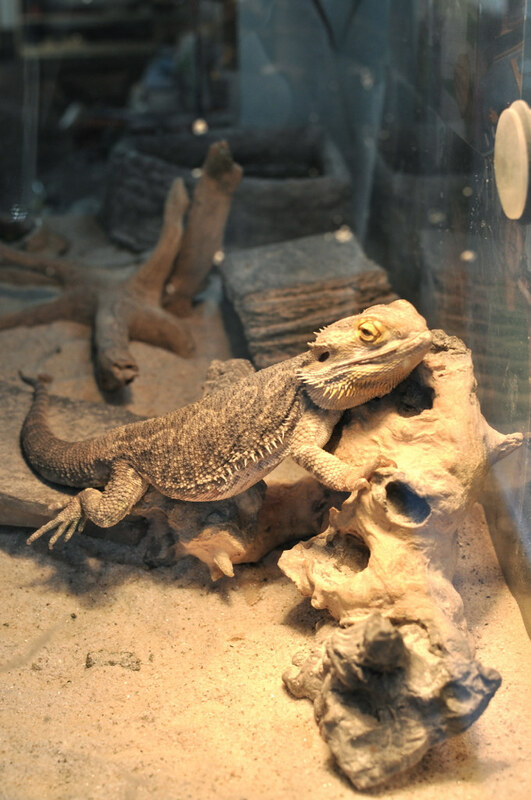 One of the many creatures in the Montessori classroom. Milo, who is in a lower elementary classroom, nearly jumps out of our moving van on the mornings we arrive early at school so he can be the first to pet and play with their classroom’s rabbit! 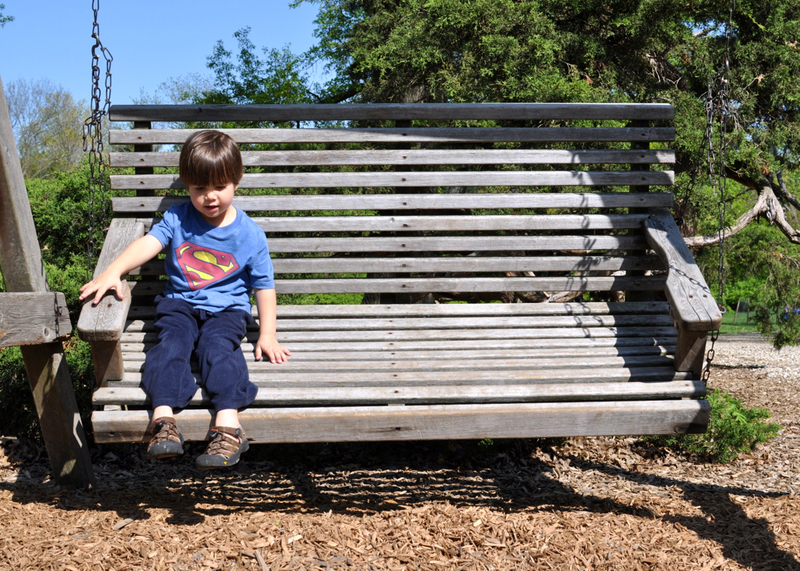 Oliver’s favorite is one of the two guinea pigs and Emil really enjoys watching the reptiles (or so he says). 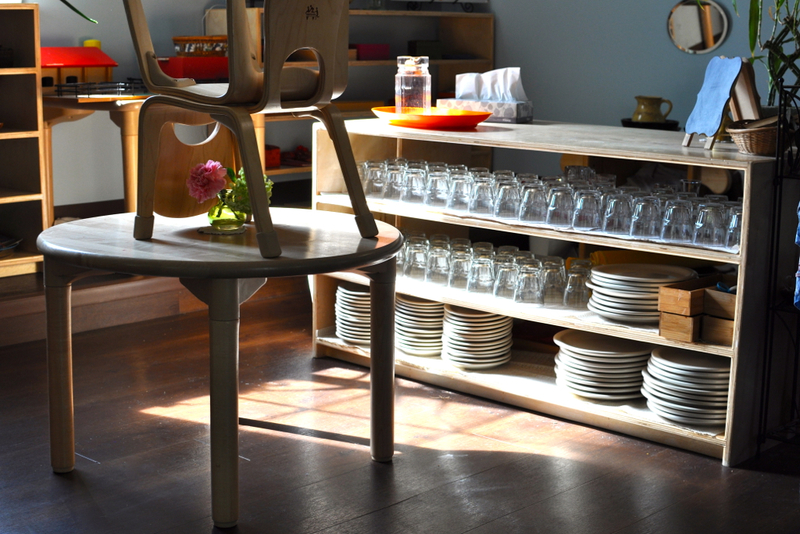 I’ll end with this picture of the afternoon light flooding in through the windows near the dishes and glasses. 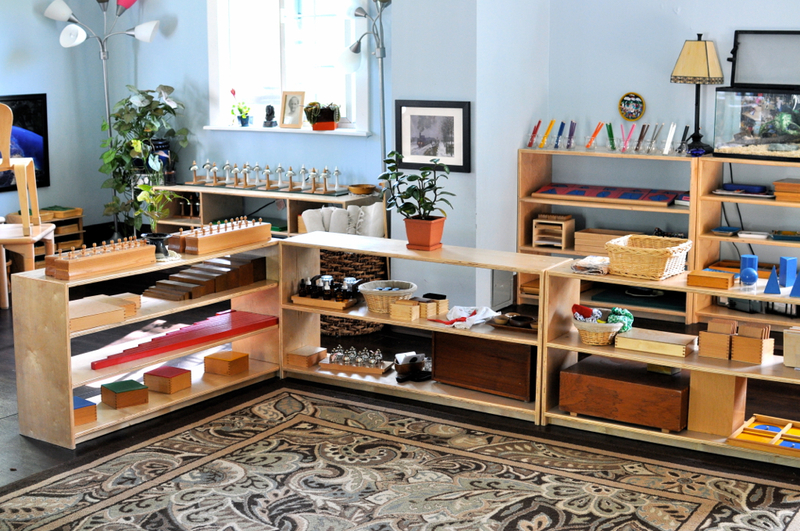 It’s a good example of how real Montessori is. The children use real glasses, real plates, real silverware, not plastic items. 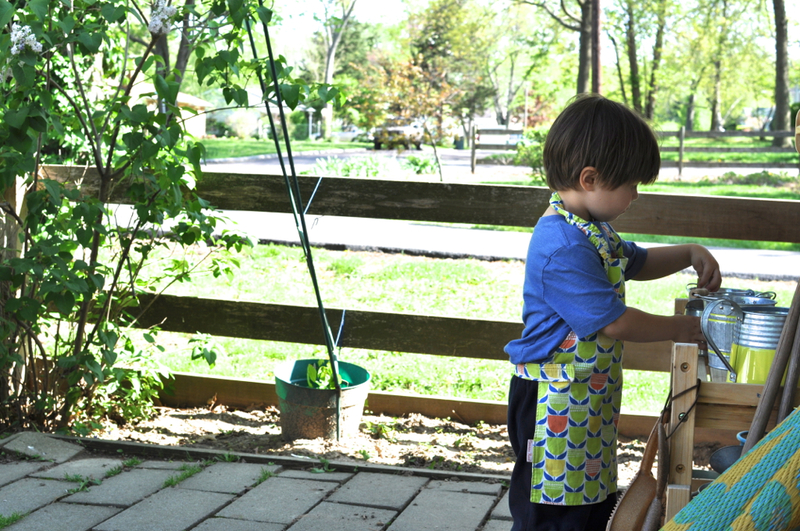 They learn to handle them carefully and even wash the dishes themselves after snack and lunch. Thank you to the lovely directresses who allowed me to document these parts of the classrooms after the children had gone for the day. I enjoyed every minute! I do hope to make it in to take some photos of the lower elementary classroom at some point when I can familiarize myself more with the materials enough to share them here without sounding completely clueless. There is some overlap of materials, also, which makes the transition from primary to elementary more smooth. For privacy reasons, I have not shared the specific school we send our boys to, but if you are interested in sending your child/children to a St. Louis Montessori school, please email me at lauren (dot) knight9 (at) gmail (dot) com and I will be happy to share that information with you, as well as put you in touch with the right person for a tour! 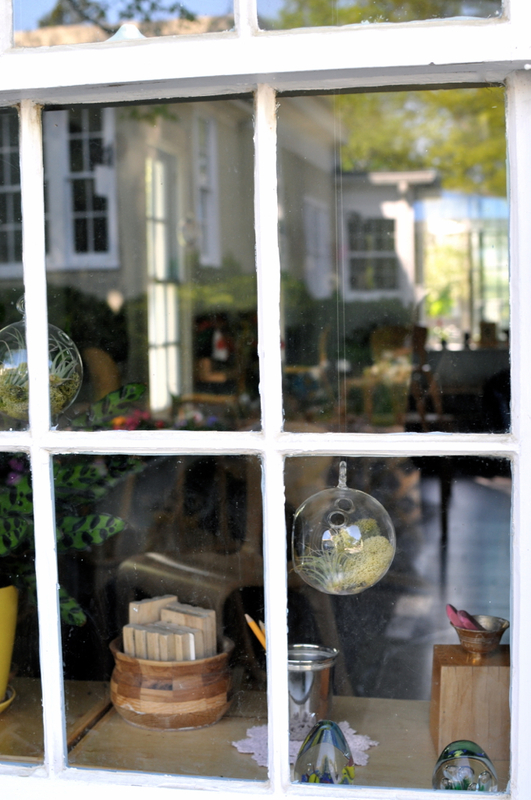 I want to go to school there, or at the very least, spend my afternoons in the perfect, serene space. What a wonderful place to send your boys. A stunning and thoughtful post! I have shared on the Montessori Mad Men’s fb page as well. Hey! It’s Melinda, it wasn’t until after we visited with the chickens that I realized I had read you post about the glass classroom the other day. Then Maria shared this post as well., click!! 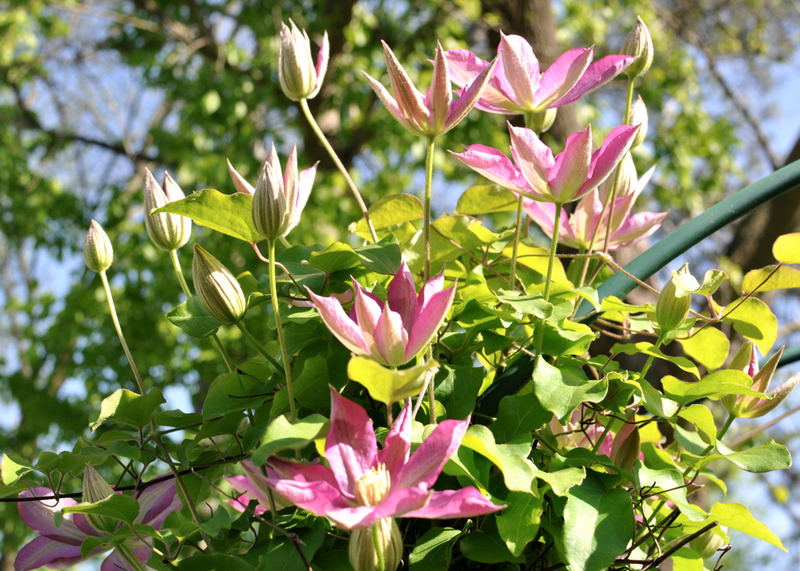 Just wanted to let you know how wonderful this post is, and your pictures are lovely!! It was nice speaking with you this afternoon!! Thank you! And Melinda, it was lovely talking with you too! Great article! Lauren, I emailed you! Uh, you are killing me with this! 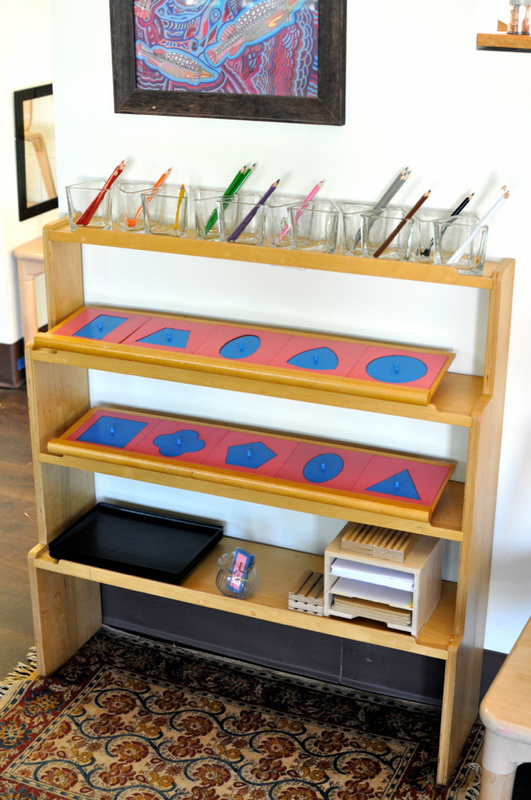 What a fantastic example of Montessori. Sweet Emil is adorable showing off his beautiful space. I’m soooo envious… the Montessori near to us isn’t quite as glorious, and at over $25k per year per child, it’s just not really possible for us. Plus I’m not quite sure how I feel about a peer group restricted to families that can afford such a steep cost for schooling… so many conflicting thoughts. But, I will definitely be trying to source a few of the tools I see in their classroom for our home. So glad you guys found such a nice spot for your boys to attend school! Lilly, $25,000?!!! That’s an absolute scandal. 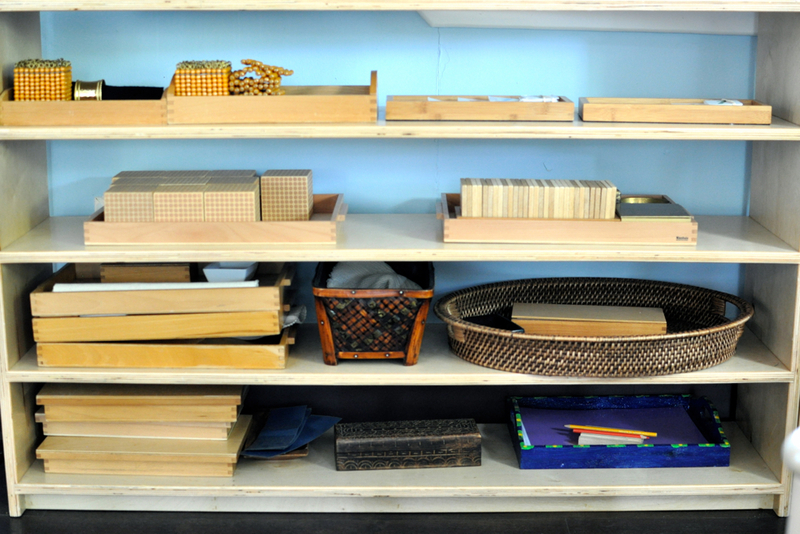 Montessori should be accessible to everyone! Yes! That’s not even hyperbole, that’s the real cost for lower elementary and then it goes up. Private school in this area is just generally not affordable for any but the very wealthy. I’m so drawn to many aspects of Montessori and Waldorf, but even if we could swing the tuition I wouldn’t feel good knowing there was so little diversity in the makeup of the class. Your school looks amazing though, very jealous!